BERLIN, Germany -- German chancellor Angela Merkel has thrown yet another lifeline to Ukraine. 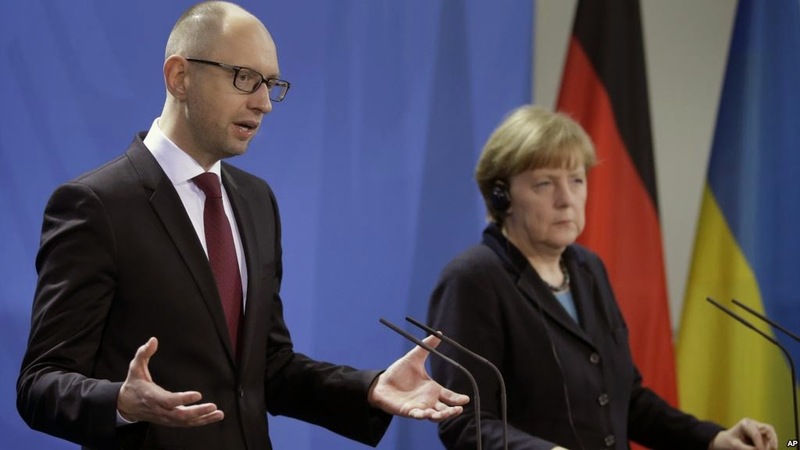 Arseniy Yatsenyuk, Ukraine’s prime minister, gets a 500 million euro ($593 million) credit line from Germany. The caveat: it cannot be used to fund any military operations fighting pro-Russia separatists in the eastern provinces. This is the second time that Berlin has bailed out the fledgling economy run by Kiev. Germany agreed to two 1.6 billion euro ($1.9 billion) aid packages last year. But this latest news has Germany acting alone instead of with its E.U. partners. Merkel’s government agreed Wednesday to fork over an additional 500 million euros ($593 million) in guaranteed credit lines for the Arseniy Yatsenyuk government. The prime minister, known as “Yats” by the U.S. State Department, signed the agreement yesterday. Russian hackers didn’t like the idea apparently. They hacked the German parliament’s home page on the same day. A group called CyberBerkut claimed responsibility for the attack. They’re the same ones behind an attack on Ukrainian voting machines last year. Russia and Ukraine have been locking horns now for over a year. While that is somewhat of an understatement (Russia and Ukraine are perennially at each others throats despite their historic and cultural connections), pro-Russian separatists in Ukraine have been making matters worse. They are trying to push annexation in four eastern provinces, or autonomy from Kiev at the very least. Their political desires — backed by Moscow — have led to massive sanctions against Russia by the U.S. and European Union. These sanctions, which began last March, have hurt the Russian economy as much as falling oil prices. Merkel’s loan guarantee comes with stipulations that Kiev cannot use the money to fund military operations in the four hotbed provinces on the Russian border. Those restrictions gave Russian credit markets some relief on Thursday. Both Ukrainian and Russian credit default swaps – which are like insurance derivatives against loan defaults – declined during today’s trading session. Ukraine’s credit risk remains astronomical, though, making it one of the biggest credit risks in the world. Market expectations are for a default sometime within the next five years. The credit lifeline should be seen as a positive for Russia. Ukraine’s solvency is important not only for political reasons, but it is in Russia’s interest for Ukraine to get its act together. Russia and Ukraine are constantly at odds over natural gas payments. A solvent Ukraine means one that, in theory, pays its bills on time for once. Economic conspiracy theorists favorite villain, George Soros, said in a commentary published in the latest issue of The New York Review of Books that the West should keep pressuring Russia with sanctions. Even so, he recognizes that with oil below $60 a barrel, sanctions could lead to a Russian default too. A Ukrainian one is already in the cards. Soros thinks the E.U. is being too cheap in its Ukraine support. He called for another $50 billion to be pumped into the former Soviet bread basket state. Yats’ budget and the reforms pushed on Ukraine by the International Monetary Fund are not enough to prevent a default, or some sort of insolvency scenario by the end of this year. Ukraine, of course, will go belly up well before Russia, which has over $350 billion in cash reserves its Central Bank. Russia’s government could shore up funding for big companies struggling to meet foreign loan payments if needed. This can not go on forever, so everyone is hoping the sanctions end on their year-long anniversary this coming July. If Ukraine defaults, Russia will be blamed for not giving Kiev any rest. Its constant barrage of fighters and peace talks and Gazprom delivery payments is making Yats and Ukraine president Petro Poroshenko’s head spin. Russia will remain the bad guy in such a scenario. Investor and business sentiment will worsen. And the Russian equity market will remain a gambling den for hedge funds throwing money at a bottom no one ever hits. Russia (RSX) exchange traded fund lost 43% of its value in the last 12 months while the MSCI Emerging Markets Index is down 1.79% by comparison. Investors will be watching yet another Russian-Ukraine-E.U. meet up next week. Vladimir Putin will meet with Poroshenko, Francois Hollande of France and Angela Merkel in Kazakhstan on Jan. 15. Washington will not be participating in the talks, as the U.S. seems more interested in kicking Russian natural gas firms out of Europe to make way for American LNG in the future. On the peace front, Washington views that as Brussels’ problem. Meanwhile, any news out of Kazakhstan that sanctions will end sooner rather than later will be a huge boost for Russian equities, regardless of the direction in oil prices. On January 19, European foreign ministers will take up the discussion of whether or not to renew Russian sanctions, some of which begin to expire in March. Most are scheduled to expire on July 31, 2015. If they are renewed, look for the popularly traded Market Vectors Russia ETF to nose dive. Vladimir Signorelli, chief economist and founder of Bretton Woods Research LLC in Long Valley, NJ has been bearish on Russia. He forecast the ruble to fall below 50 when it was still trading in the 30s. In a note to clients on Thursday, Signorelli sounded surprisingly upbeat about next week’s meetings. “Given the impact that the Ukraine variable has had on financial markets since February 2014, this could be a game changer,” he says.